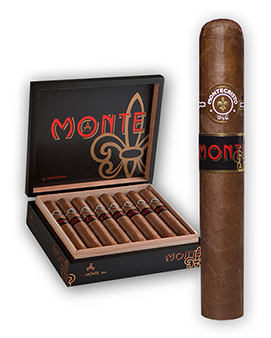 One of the most iconic cigar brands in the world introduces a new cigar with a fresh look ~ the Monte by Montecristo. Blended by the famed Grupo de Maestros and handmade in the Dominican Republic, the medium- to full-bodied Monte offers limitless complexity and depth. The cigar's signature feature is a two-binder combination of spicy Dominican Olor and strong, aromatic Nicaraguan Corojo. Joined with an aged Dominican filler and wrapped in rich Ecuadorian Habano leaf, the Monte creates an experience only Montecristo can deliver and easily upholds the legendary brand's mantle.